Warrick De'Mon Dunn (born January 5, 1975) is a former American football running back who played in the National Football League (NFL) for twelve seasons. He was drafted by the Tampa Bay Buccaneers 12th overall in the 1997 NFL Draft, after playing college football at Florida State. Dunn was named AP NFL Offensive Rookie of the Year in 1997 and earned three Pro Bowl selections in his career. After his playing career, Dunn took a minority stake in the Falcons' ownership group led by Arthur Blank. On January 7, 1993, Dunn's mother, Betty Smothers, an off-duty police officer escorting a businesswoman to a bank to make a night deposit, was ambushed and killed by armed robbers. Three men were sent to prison for the murder, and two remain on death row. Dunn, two days after his 18th birthday, became the head of his family and raised his siblings. Dunn met with one of the convicted men at the Louisiana State Penitentiary in 2007. Dunn played college football at Florida State University, graduating in 1997 with a bachelor's degree in information studies. He was a three-time All-ACC selection. Dunn's jersey, along with those of other Seminoles players such as Fred Biletnikoff, Ron Sellers, Ron Simmons, Charlie Ward, Deion Sanders, and Chris Weinke, has been retired by the university. His number (28) may still be worn by Seminole players, but his jersey will be displayed in the Moore Athletic Center at FSU. He also won a National Championship in 1993 with Florida State. 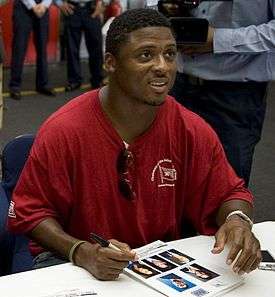 Warrick Dunn was also an accomplished track and field star, named as an Associated Press All-American as a member of Florida State's Men's 4x100m relay team. Dunn competed on the Seminoles' Track & Field team as a sprinter during all four years he was enrolled at Florida State. His personal best in the 100 meters is 10.3 seconds. Dunn was selected in the first round of the 1997 NFL Draft with the 12th overall pick by the Tampa Bay Buccaneers. In his rookie season Dunn made an immediate impact for the Buccaneers squad. As the year finished he was selected to the NFC Pro Bowl team and was named the Associated Press Offensive Rookie of the Year. Dunn spent the next four years of his career in Tampa Bay where he was named to the Pro Bowl twice (1997, 2000). A free agent in the 2002 offseason, Dunn signed with the Atlanta Falcons. Once again, he made a positive impact on his team with 9 total TDs and in that year, he led the league with a 5.4 yards per carry average. Dunn scored the most rushing touchdowns in his career, 9, in the 2004 season despite splitting carries with T.J. Duckett and also led the team in rushing with 1,106 yards. Having led his team in rushing yards again in 2005, Dunn was named the NFC's Pro Bowl team, marking his third selection to the team. For his career, Dunn has only missed 10 games and has a total of 2,256 carries for 9,461 yards 43 touchdowns and a 4.2 average. Dunn finished his first 10 seasons with over 1,000 combined rushing and receiving yards. During the 2007 season, with Falcons starting quarterback Byron Leftwich out with a high ankle sprain, Dunn served as the third string emergency quarterback behind Joey Harrington and Chris Redman, a position he played in high school. On March 3, 2008, the Falcons released Dunn per his request. This came a day after the Falcons signed former San Diego Chargers backup running back Michael Turner. On December 17, 2009 he became a minority owner of the Atlanta Falcons. On March 10, 2008, Dunn returned to the Buccaneers after signing a two-year, $6 million contract. In week 6 against the Carolina Panthers, Dunn had his first 100-yard game since re-joining the Buccaneers. Dunn was released by the Buccaneers on February 25, 2009. Dunn established the Homes for the Holidays (HFTH) program in 1997, and started Warrick Dunn Charities (WDC) in 2002 as a way to grow programs and services. The HFTH program rewards single-parent families for reaching first-time homeownership. HFTH recipient families are chosen through a partnership with Habitat for Humanity affiliates and WDC with complete home furnishings and down-payment assistance. As of July 2012, HFTH has assisted over 150 single parents and over 300 dependents in Atlanta, Baton Rouge, Tampa and Tallahassee. By providing families with a positive home environment, WDC believes that children can thrive educationally, socially and economically. Dunn's achievements have been recognized over the years. He received a Giant Steps Award in civic leadership from former President Bill Clinton for his program. In 2005, Dunn was presented with the Walter Payton Man of the Year Award; named after the Chicago Bears running back who died in 1999, the award is the only NFL award that recognizes a player for his community service as well as for his excellence on the field. In the aftermath of Hurricane Katrina, Dunn challenged all NFL players, except for those who play for the New Orleans Saints, to donate at least $5,000 to the effort. The effort received over $5 million in contributions. In 2007, Dunn, along with Andre Agassi, Muhammad Ali, Lance Armstrong, Jeff Gordon, Mia Hamm, Tony Hawk, Andrea Jaeger, Jackie Joyner-Kersee, Mario Lemieux, Alonzo Mourning and Cal Ripken, Jr., founded Athletes for Hope, a charitable organization that helps professional athletes, sports industry professionals and fans get involved in charitable causes. For his exceptional involvement on and off the field, Dunn was awarded with the 2009 Bart Starr Award. He also received a Jefferson Award for Outstanding Athlete in Service and Philanthropy in 2011. Dunn's 2008 autobiography, Running For My Life ISBN 978-0-06-143264-4, details his mother's murder and his battles with depression throughout his life. ↑ Gary Shelton (December 16, 2007). "Confronting his pain". St. Petersburg Times. Retrieved 2007-12-17. ↑ Wyche, Steve (2008-03-03). "Falcons release Warrick Dunn". The Atlanta Journal-Constitution. Retrieved 2008-03-03. 1 2 "Warrick Dunn Stats". ESPN Internet Ventures. Retrieved 11 March 2014. Wikimedia Commons has media related to Warrick Dunn.